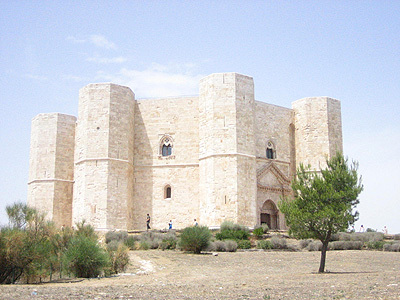 Not very far from Altamura and Andria, one can visit the beautiful Castel del Monte, built on the express wishes of Emperor Federick II on 29th January 1240. In 1996, the City became a UNESCO World Heritage of Humanity site. Castel del Monte seems to have been made to astonish both the common visitor and the more studious. In fact, it’s an enigmatic construction, which today, still conserves some unresolved mysteries. Geographically speaking, it seems that the place assumes a particular reasoning and that the internal courtyard low relief was stolen during Medieval times. Furthermore, on two precise days of the year (8th April and 8th October), it is illuminated by the first rays of sun, revealing a particular, but sadly now lost forever, symbolic meaning. Moreover, the Castle dominates almost the whole Murge plateau and is easily visible from the sea along the coast. Still, Castel del Monte does not have a defensive structure, moat or drawbridge and therefore cannot be a defensive fortress. Its use for hunting purposes, a sport which was loved by Federick II, is also in doubt due to the absence of horse stables. What then was its main function? Today, for the great prevalence of symbolic elements, beginning with its dimensions and beautiful portal, it is considered a kind of temple. The thesis is also supported by the building’s octagonal shape, which has an intermediate shape between the square and circle, symbolising the earth and sky; a possible meaning of ascension or spiritual elevation. The design of its portal contains Federick II’s signature, a gigantic reflected F with a vertical line passing through its axis. There are lions above the portal which are orientated towards a point in the horizon where the sun rises during the summer and winter solstices. In this way, even the orientation of the whole Castle has strong connections with the cardinal points. Apart from the specific significance of the Castle, a visit to this place is not to bee missed for the wonderful atmosphere which it manages to evoke and the splendid panorama which can be enjoyed from the Murge plateau.